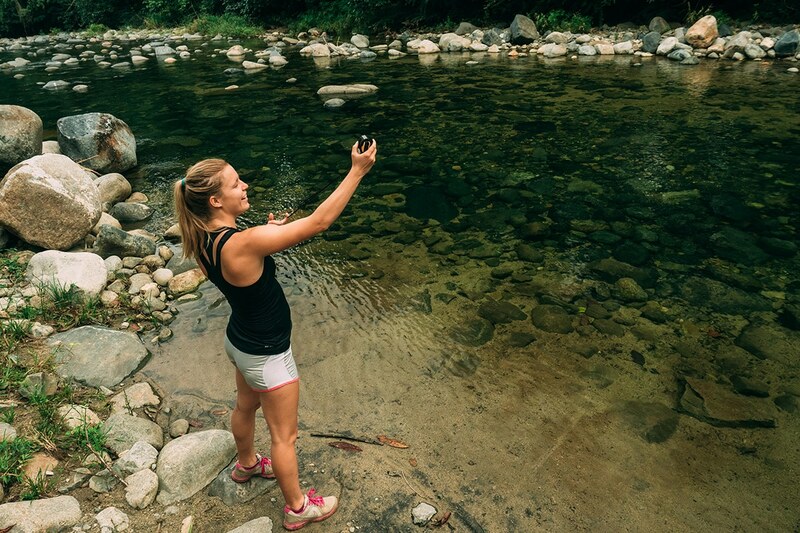 Share the post "Pixel By Pixel"
Lauren Wheeler hikes down a dirt road toward the Rio Pacora in Panama’s Tres Brazos Valley, talking excitedly about tropical climates over the sounds of howling monkeys, chirping birds and buzzing cicadas. Without missing a beat, she stops at a fenced in area of cattle and scribbles its GPS coordinates in her notebook. Approaching the river’s edge, she kneels down to check the GPS coordinates. Wheeler, a 21-year-old geography student from New Jersey, is spending her summer as a Kalu Yala design intern. Her goal? Using Geographic Information Systems (GIS), she’s set out to digitally map Kalu Yala’s 500-acre jungle property in its entirety. “It’s a real-life SimCity,” Wheeler explains later that day, opening her laptop under one of Kalu Yala’s wooden ranchos as a torrential downpour pounds the earth around us. She clicks through her GIS software application, plotting a series of miniscule dots that connect to form solid black lines. She can use the application to create detailed, scaled maps of towns, cities, mountains and rivers, digitized representations of anywhere on planet earth. She selects a river on her current map and plugs in a hypothetical four-mile floodplain. The GIS software allows her to see exactly which homes on her map would be affected by the flood. But this example barely scratches the surface when it comes to the fortune-telling power of GIS mapping. Entire highway systems, waterways, and soil types can be documented, as can the precise slopes of hills and mountains. Data can even be stored about the specific animal, plant, and bacterial species that inhabit the area. Dr. David L. Tulloch, a professor at Rutgers University and a consultant for the New Jersey State Bureau of GIS, says that GIS is the only modern software application with enough computing power to address many of today’s most complicated problems, including overpopulation and climate change. For example, Tulloch explains, estimates of sea level rise can be combined with data about transportation networks to find evacuation routes that need to be redesigned. Or projections of temperature changes might be modeled with vegetation conditions to show areas where plant communities will be most affected. GIS has already proven a successful tool for addressing a number of issues around the globe. The Jane Goodall Institute in the Congo has used GIS, Tulloch says, to protect the natural habitats of chimpanzees and to guide the planning of villages in Tanzania. Meanwhile, residents of New Jersey can use a GIS-enabled flood mapper to explore the potential impacts of sea level rise on the Jersey Shore. In the future, Tulloch hopes individual users will utilize GIS technology to contribute their own local data and information. This will allow citizens to directly participate in their government’s planning processes. Wheeler’s initiative at Kalu Yala is an attempt to do just that. She hopes that her work will contribute to the sustainable community’s ability to grow responsibly, ultimately having a net-positive effect on its environment rather than degrading its natural resources.